The Tata Salt that we offer is prepared by employing vacuum evaporation technology that ensures the end product is untouched by hand. The offered salt is generally used in the homes, restaurants, hotels and many more places for preparing food items. The pioneer of salt iodisation in India, Tata Salt, holds the distinction of being India's first national branded iodised salt. It has been consistently recognised as one of the country's leading food brands. Hypertension or high blood pressure is one of the leading health problems health problems urban india suffers from stressful lifestyles coupled with altered food practices have led to an exponential increase in the occurrence of lifestyle diseases such as diebetes and high blood pressure. We are a prominent Supplier of Iodized Salt. These are widely known for their rich taste, purity and high nutritional value. 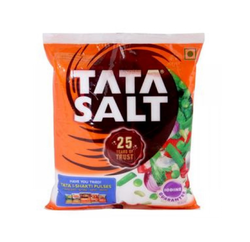 Refined, iodised and potassium enriched, Tata Salt Lite is a low-sodium salt specially formulated to provide 15% lower sodium than regular salt. It is designed to provide consumers a convenient means to take preventive measures towards keeping the blood pressure and weight of family members in check. Launched in 1983, Tata Salt provided an assurance of purity in a market where unbranded salt of dubious quality was the norm. Using Vacuum. 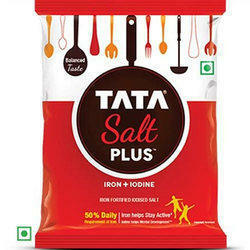 - of Tata Salt Plus to your everyday food.